Ramzan is the month of blessings but Ramzan shows have turned the holy month into prize-winning competitions. However, Pemra is taking action to finish this growing trend by restricting Gameshows to be aired only after 9 pm. After Geo Tv, Pemra has now issued a legal notice to ARY Digital after the channel failed to comply with the watchdog’s orders and “Jeeto Pakistan” popular game show hosted by Fahad Mustafa was aired at 8 pm. 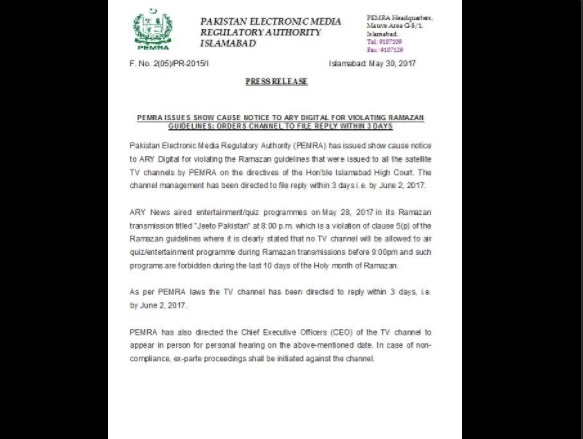 Pemra has asked the channel for a reply within 3 days and the CEO himself should appear before the High Court Islamabad.